Born in Germany in 1959, Silvia Hartmann has lived and worked in the United Kingdom since 1978. Hartmann is the original developer and creator of Modern Energy. In 1998, Silvia Hartmann created The GoE, the world's first certifying body for modern energy and begun the work to create a logical, wide reaching and cohesive training structure for modern energists from the ground up. To this day, Silvia Hartmann continues to lead the GoE as president and to evolve the Third Field of MODERN Energy. Silvia Hartmann's favourite saying is "Love without logic is insanity. And vice versa." In the 1980s, I was working as a professional animal behaviourist and consultant. A part of this work involved original research, and the research project was to find the cause of "rage syndrome" in animals. This is when an animal - a companion animal, a zoo animal, a domesticated animal - attacks to kill, without warning and out of character for the individual. The research team of which I was a member discarded one theory after the other. We worked scientifically and studied everything we could think of, from environmental toxins and poisons to genetic predisposition, food additives (for a long time, a high candidate for the "smoking gun"), inoculations, caretaking and more. The trigger or actual cause for rage syndrome remained elusive for twelve long years - until the day I had a moment of enlightenment, and I found not only a research direction which had been entirely overlooked, but the actual answer to how, why and when animals develop rage syndrome. I realised that there is an invisible "something" being exchanged between social mammals, which is as important to their survival as is food and water. The presence or absence of this something drives every form of behaviour, including extreme survival behaviour. This something was what we now call energy; back then, I thought of it as love. Energy - that invisible connection between social mammals - has EVERYTHING to do with how individuals behave. When a social mammal becomes deprived of this energy, it will show incrementally more disturbed behaviours until there is a threshold shift and rage syndrome must manifest. Please note I am saying that it MUST manifest - this is structural, entirely systemic and will happen in any social mammal in a predictable fashion. When I first realised this, it was like a lightning strike. The information was there all at once, and I knew I had cracked the problem of rage syndrome. It was the effects of the absence of energy, an absence of love. And so, on a beautiful August afternoon in 1993, my young past aspect went into the front room where her extensive animal behaviour library was housed at the time. She took one book after the other off the shelves, and looked through each one, and she tried to find the word LOVE - but it wasn't in any of them. The afternoon turned to evening, then to night, and there she sat, on the carpet, surrounded by a sea of books she could no longer read, and she knew that something had to be done to bring love back into science. She knew that without love, without ENERGY, the world can never make any sense at all. She went on to test her theory on love and attention as the drivers for behaviour, both good and bad behaviour, and created the "Attention Seeking Behaviour Disorder Scale" in 1993, described in "The Harmony Program." The theory held; not only that, it produced a true flowering of new, more humane, more reasonable, more logical and at the same time, more loving techniques, methods, patterns and approaches. It was obvious from the start that what the young animal behaviourist had discovered, also held for the other social mammals - humans. And here we are, 25 years later (in 2018). 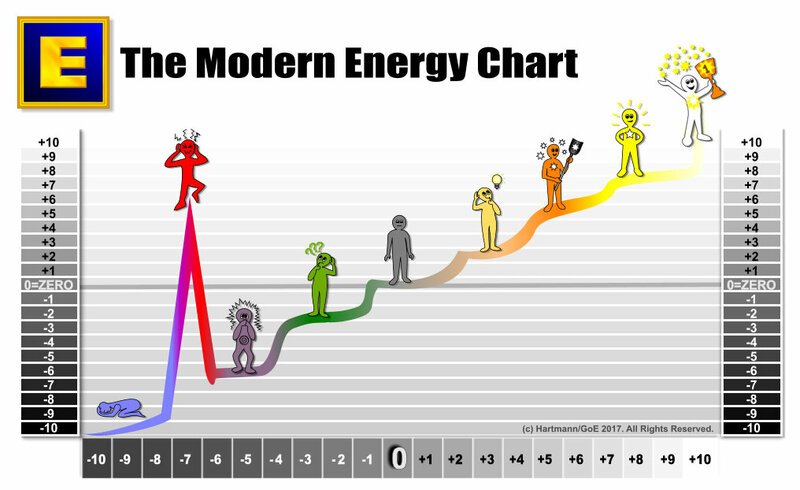 We now have the Modern Energy Chart, with its positive wing of potential beyond our wildest dreams. We now have The Guild of Energists, a gathering of modern people who also want to have both love and logic to explain the Universe, and to live happier, more fabulous lives. Modern Energy is the missing "Third Field" in the Mind, Body, Spirit triad. Modern energists are people who address that extraordinary component of actual reality, the worlds of energy. Our methods are logical, provable, empowering and inspiring. The purer and more perfect love becomes, the more logical it becomes; and the same holds true for logic, which becomes ever more beautiful, ever more love filled and astonishing, the purer it becomes in turn. There is a place where both become one and the same - not different sides of a coin, but actually one and the same. Science is in desperate need of understanding love - understand energy, understanding emotion because without this, you cannot ever do pure science at all. The practices of spirituality, likewise, are in desperate need of understanding logic - pure, perfect logic that is as profound as it is beautiful. Modern energism is amazing, extraordinary and puts a sparkle on everything - it gives us back the whole world, the whole universe, and we get to live once more like a child, filled with wonder and full of grace, joy and amazement at this life of ours. I want to make people happier. I want to make the world of man a better place.